Thank you for joining the HTML Writers Guild. Established in 1994, we are the leading organization and trade group for the web design community. Our instructors will be happy to help you advance in the arts of Layout, Graphics, Text, Paragraphs, Alteration, Destruction, Necromancy, or Tables. There is another, powerful art, so dark it is only known to a handful of our members, but you must not even speak its name. It is only referred to as F.
The HTML Writers Guild - praise be to Baphomet - holds secrecy as one of our greatest attributes. No one knows where HTML comes from and this mysterious source must be guarded with all of our weapons. The greatest crime of a brother or sister is to speak of our secrets to a member of those who do not know our ways. Depending on the severity of the breech you can expect a terrible punishment to be inflicted. If you divulge true knowledge of the F you will be disemboweled and hung from a bridge. To advance in the HTML Writers Guild you will be asked to complete various tasks in order to advance in rank and gain more access to guild facilities. As a Supplicant you will only be able to use notepad.exe and the chest for storing your items. You can pray to the idol of Baphomet, but it will not grant you any boons until you have at least attained the rank of Scourge. An example of a task you may be asked to complete is figuring out how to get iTunes to work with two iPods owned by different people so it will stop overwriting the Penumbral Viceroy's Back Eyed Peas albums with Guildmaster Septicus' Jerry Band collection and Savage Love Podcasts. Another task you may be asked to complete is making text scroll back and forth, but only in Netscape. Do you know how to embed a MIDI? You may also be required to assassinate a member of the council of elders. Whatever pleases the Guildmaster. Hard work and advancement have their rewards. Supplicant - You are entitled to wear novice robes and the symbol of our order as well as use notepad.exe. Webizen - You may wear the symbol of a webizen (similar to Go Daddy logo), you may use the ping pong table in the break room. Journeyman - You may use the alembic to create potions and download up to two pieces of shareware. 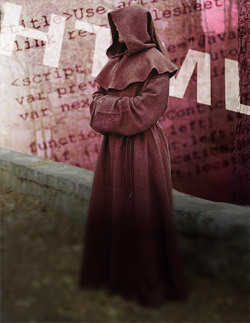 Netspert - You can go on our chatroom and temporarily ban people and also wear the robes of an Acolyte. Acolyte - You can use our shared Writers Guild Yahoo email address. Cyberman - You can spec out your own rig and start saving money for it. You can also use the gold you receive from designing wicked websites to start decorating your lair with humorous posters and figurines. Scourge - You can wear the Scourge robes and the golden symbol of our order. You are granted the secret of the mouse over graphic. Tucowsendentalist - You can go everywhere in the office on a skateboard and listen to your mp3 CD player. Penumbral Viceroy - The knowledge of F is bestowed upon you. We can say no more other than your web page's navigation will henceforth be static while visitors to your web page are free to move around. Guildmaster - You will never attain this rank, lowly worm. Only the greatest heroes of our order ever reach such masteries of HTML. Your journey begins in our ranks, supplicant. The ceremony of blood will baptize you in our ways and you will swear your final oath to the guild and to Baphomet. Your first task will be to program a cute tool bar for this local baby clothes website. They want you to use the font where all the letters are shaped like babies.